We invite applications for a postdoc position in the laboratory of Steve Luck at the UC-Davis Center for Mind & Brain (http://lucklab.ucdavis.edu). Both U.S. and international applicants are welcome. Multiple years of funding are possible. Our lab places significant emphasis on postdoctoral training, and we have an excellent track record of placing our postdocs in faculty and industry positions. The research will focus on basic mechanisms of visual attention and visual working memory, using a combination of ERPs, psychophysics, eye tracking, and possibly fMRI. Our current research makes extensive use of applying multivariate analysis methods (e.g., machine learning, representational similarity analysis) to ERP data. We are seeking an individual with an excellent background in the theories and methods of visual cognition and/or cognitive neuroscience. Experience with ERPs and eye tracking is desirable but not required; this will be an ideal position for someone who is interested in learning these methods or someone who already has substantial experience but wants to become a world-class expert. Good quantitative and coding skills are essential. A PhD or equivalent degree is required prior to beginning the position. Salary will depend on experience, with a minimum set by the University of California postdoc salary scale (which is higher than NIH scale). The position will remain open until a suitable candidate is identified. We are aiming for a start date between June 1, 2019 and September 30, 2019. Davis is a vibrant college town in Northern California, located approximately 20 minutes from Sacramento, 75 minutes from San Francisco, 45 minutes from Napa, and 2 hours from Lake Tahoe. The Center for Mind & Brain is an interdisciplinary and collaborative research center devoted to cognitive science and cognitive neuroscience, located in a beautiful building with state-of-the-art laboratories. Our lab is also a part of the Visual Cognition Research Group, providing opportunities for collaboration with several related laboratories. To apply, send a cover letter describing your background and interests, a CV, and at least one letter of recommendation to Aaron Simmons (lucklab.manager@gmail.com). UC Davis is a diverse community that welcomes individuals from underrepresented and disadvantaged groups, and all applicants are encouraged to include a statement of contributions to diversity with their materials. Many young academics are (justifiably) stressed out about their career prospects, ranging from the question of whether they will be able to get a tenure-track position to whether they will be able to publish in top-tier journals, get grants, get tenure, and do all of this without going insane. Life in academia has been challenging for a long time, but the level of competition seems to be getting out of control. The goal of this piece is to discuss some ideas from population biology that might help explain the current state of hypercompetition and perhaps shed light on what kinds of changes might be helpful (or unhelpful). 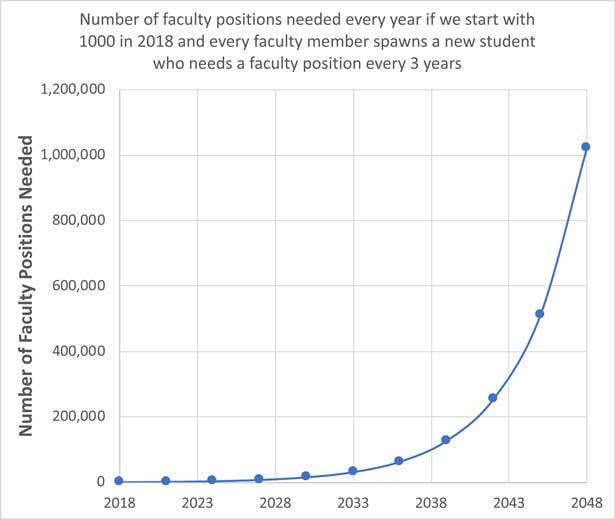 Here’s the problem in a nutshell: if we want to provide a tenure-track faculty position for every new PhD who wants one, the number of available positions would need to increase exponentially with no limit. This is shown in the graph below. If we assume that a typical faculty member has a couple grad students at any given time, and most of them want jobs in academia, this faculty member will have a student who graduates and wants a faculty position approximately every three years. As a result, we would need to create a new faculty position approximately every three years just to keep up with the students from a single current faculty member. As if this wasn’t bad enough, these recent PhDs will then get their own grad students, who will also need faculty positions. This leads to an exponential growth in the number of positions needed to fill the demand. For example, if we have 1000 positions in a given field in the year 2018, we will need another 1000 positions in that field by the year 2021 to accommodate the new students who have received their PhDs by that time, leading to a total of 2000 positions to accommodate the demand that year. The faculty in these 2000 positions will have students who will need another 2000 positions by the year 2024, leading to a total need for 4000 positions that year. If the number of positions kept increasing over time to fill the demand, we would need over a million positions by the year 2048! This doesn’t account for retirements, etc., but those factors have a very small effect (unless we start forcing faculty to retire when they reach the age of 40 or some such thing). There are various other assumptions here (e.g., a new PhD every 3 years), but virtually any realistic set of parameters will lead to an exponential or nearly-exponential growth function. This is just like the exponential increase you might see in the size of a population of organisms, with a rate factor (r) that describes the rate of reproduction. However, an exponential increase can happen only if reproduction is not capped by resource limitations. Resource limitations lead to a maximum population size, which population biologists call K (for the “carrying capacity” of the environment). When the exponential growth with rate r is combined with carrying capacity K, you get a logistic function. 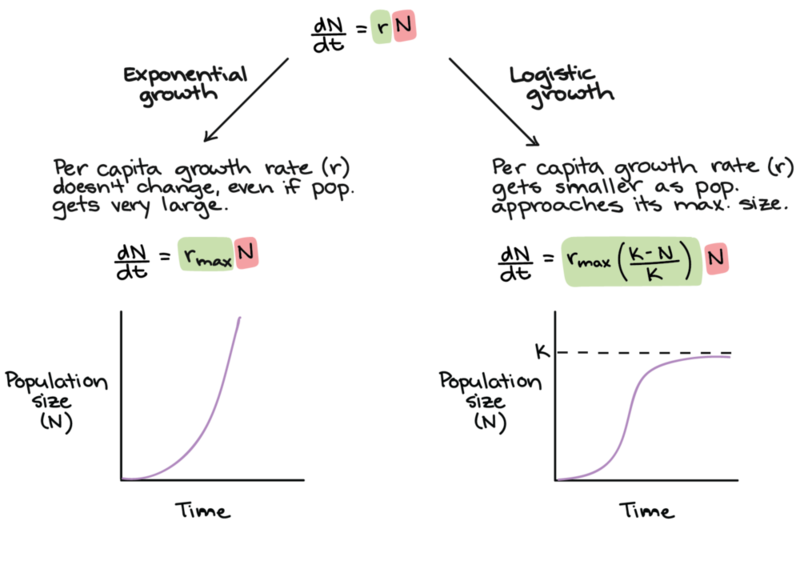 This is shown in the picture below (from Khan Academy), which illustrates the growth rate of a population of organisms with no limit on the population size (the exponential function on the left) and with a limit at K (the logistic function on the right). At early time points, the two functions are very similar: K doesn’t have much impact on the rate of growth in the logistic function early in time, and growth is mainly limited by r (the replication rate). This is called “r-limited” growth. However, later in time, the resource limitations start impacting the rate of growth in the logistic function, and the population size asymptotes at K. This is called “K-limited” growth. It’s much nicer to live in a period of r-limited growth, when there are plenty of resources. When growth is K-limited, this means that the organisms in the population have so few resources that they die before they can reproduce, or are so hungry they can’t reproduce, or their offspring are so hungry they can’t survive, etc. Not a very pleasant life. In academia, r-limited growth means that jobs are plentiful, and the main limitations on growth are the number of students per lab and the rate at which they complete their degrees. By contrast, K-limited growth basically means that a faculty member needs to die or retire before a new PhD can get a position, and only a small fraction of new PhDs will ever get tenure-track jobs and start producing their own students. This also means that the competition for tenure-track jobs and research grants will be fierce. Sound familiar? In the context of academia, K represents the maximum number of faculty positions that can be supported by the society. The maximum number of faculty positions might increase gradually over time, as the overall population size increases or as a society becomes wealthier. However, there is no way we can sustain an exponential growth forever (especially if that means we need over a million positions by 2048 in a field that has only a thousand positions in 2018). I think it’s pretty clear that we’re now in a K-limited period, where the number of positions is increasing far too slowly to keep up with the demand for positions from people getting PhDs. When I was on the job market in the early 1990s, there were already more people with PhDs than available faculty positions. However, the problem of an oversupply of PhDs was partially masked by an increase in the availability of postdoc positions. Also, it was becoming more common for faculty at “second-tier” universities to conduct and publish research, so the actual number of positions that combined research and teaching was increasing. But this balloon has stretched about as far as it can, and highly qualified young scholars are now having trouble getting the kind of position they are seeking (and we’re seeing 200+ applicants for a single position in our department). In addition to a limited number of tenure-track faculty positions, we have a limited amount of grant money. In some departments and subfields, getting a major grant is required for getting tenure. Even if this isn’t a formal requirement, the resources provided by a grant (e.g., funding for grad students and postdocs) may be essential for an assistant professor to be sufficiently productive to receive tenure. But an increase in grant funding without a commensurate increase in permanent positions can actually make things worse rather than better. We saw that when the NIH budget was doubled between 1994 and 2003. This led to an increase in funding for grad students and postdocs (leading to the balloon I mentioned earlier). However, without an increase in the number of tenure-track faculty positions, there was nowhere for these people to go when they finished their training. Their CVs were more impressive, but this just increased the expectations of search committees. Also, a lot of the increased NIH funding was absorbed by senior faculty (like me) who now had 2, 3, or even 4 grants instead of just 1. As usual, the rich got richer. One might argue that competition is good, because it means that only the very best people get tenure-track positions and grants. And I would be the first person to agree that competition can help inspire people to be as creative and productive as possible. However, the current state of hypercompetition clearly has a dark side. Some people write tons of grants, often with little thought, in the hopes of getting lucky. This can lead to poorly-conceived projects, and it can leave people with little time to think about and actually conduct high-quality research. And it can lead to p-hacking and other questionable research practices, or even outright fraud. I think we’re way beyond the point at which the level of competition is beneficial. Now let’s talk about solutions. Should we increase the number of tenure-track faculty positions at research universities? I would argue that any solution of this nature is doomed to failure in the long run. Increasing the number of position is an increase in K, and this just postpones the point at which the job market becomes saturated. It would certainly help the people who are seeking a position now, but the problem will come back eventually. There just isn’t a way for the number of positions to increase exponentially forever. We could also try to limit the number of students we accept into PhD programs. This would be equivalent to decreasing r, the rate of “reproduction.” However, for this to fully solve the problem, we would need the “birth rate” (number of new PhDs per year in a field) to equal the “death rate” (the number of retirements per year in the field). Here’s another way to look at it: if the number of positions in a field remains constant, a given faculty member can expect to place only a single student in a tenure-track position over the course of the faculty member’s entire career. Is it realistic to restrict the number of PhD students so that faculty can have only one student per career? Or even one per decade? Probably not. I have only one realistic idea for a solution, which is to create more good positions for PhDs that don’t involve “reproduction” (i.e., training PhD students). For example, if there were good positions outside of academia for a large number of PhDs, this would reduce the demand for tenure-track positions and decrease r, the rate of reproduction (assuming that there would be fewer people “spawning” new students as a result). Tenure-track positions at teaching-oriented institutions have the same effect (as long as these institutions don’t decide to start granting PhDs). I don’t think it’s realistic to increase the number of these teaching-oriented positions (except insofar as they increase with overall changes in population size). However, in many areas of the mind and brain sciences, it appears that the availability of industry positions could increase substantially. Indeed, we are already seeing many of our students and postdocs take jobs at places like Google and Netflix. Many faculty in research-oriented universities think that success in graduate school means getting a tenure-track faculty position in a research-oriented university. However, if I’m right that the current K-limited growth curve—and the associated hypercompetition—is a major problem, then we should place a much higher value on industry and teaching positions. The availability of these positions will mean that we can continue to have lots of bright graduate students in our labs without dooming them to work as Uber drivers after they get their PhDs. And teaching positions are intrinsically valuable: A great teacher can have a tremendous positive impact on thousands of students over the course of a career. We ask how the mind operates, how it is implemented in the hardware of the brain, and how it goes awry in people with schizophrenia. We focus mainly on the visual system, which provides a solid foundation for asking difficult questions about more abstract cognitive concepts.